Right from the outset, we must be very clear that this real-life, live-in test will reveal a lot more (both positive and negative) about a van than a standard review. Full marks must go to Jayco for even allowing us to take one of their off-road camper trailers along freeways, back roads, dirt tracks, as well as sand, mud and water crossings. 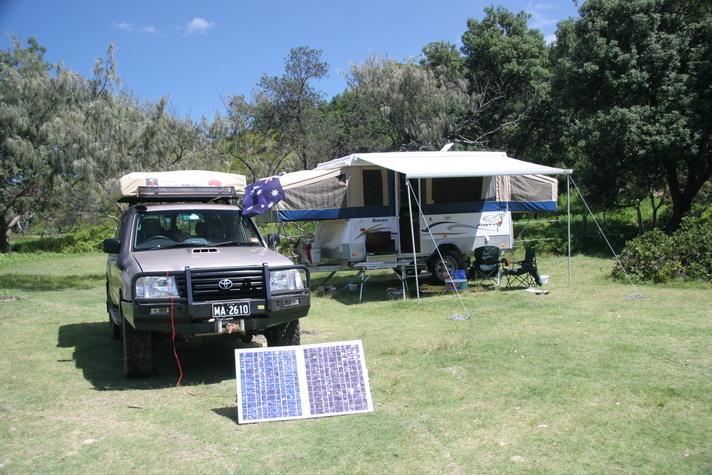 Also worth mentioning, is that the range of Jayco camper trailers, in particular their Outback series, are not meant to compete with the many dedicated, heavy-duty camper trailers (tent trailers) on the market that are aimed at tackling Australia’s worst roads and indeed places where there are no gazetted roads. Jayco’s camper trailer range are a step down in size from a full sized caravan, but a step up in comfort levels of most of the dedicated off-roaders that are often no more than a tent on wheels. They offer a perfect compromise between off-road ability and caravan comfort – something that we were keen to test all aspects of. The Swan is Jayco’s largest (of seven lengths and floor plans available) camper trailer, weighing in at just under 23G – that’s a pretty good start when you consider many tent trailers are priced higher. The new range of Jayco campers have been upgraded from aluminium exterior walls to a smooth high gloss finish, which is made up of an exterior fibreglass sheet, then plywood sheet, a foam insulation in the centre with the 42mm aluminium tube frame, and interior timber panelling. Complete with ‘Outback Pack’, the Jayco campers certainly look the goods with the 250mm raised ride height (thanks largely to an underslung axle), larger diameter alloy rims, dedicated 4WD tyres and chequer plate lower panelling – albeit thin walled. Crawling under the van will see a 150mm by 50mm main chassis with 125mm by 50mm A-frame and Treg poly block coupling – something many dedicated 4WD tent trailers fail to better. Alco Outback leaf springs with shock absorbers (complete with stone guards) and Alco off-road electric brakes finish of making this range of Jayco’s’ underbodies tough enough to withstand the hard yards of off-bitumen use. To offset the added ride-height of the outback pack, the four corner stays have been lengthened and a second fold down step added to the entry. With the use of Jayco’s ‘millennium’ chassis, most wiring and plumbing can be kept up high out of harms way – especially useful when off road. The only places I dragged the van – up some very serious sand dunes and one deep rut – was the handbrake guard. While it did a great job of protecting the brake lever, one can only guess as to why the brake lever wasn't placed higher in the first place – that would have saved ploughing that thick piece of angled steel through the ground! The long draw bar made reversing a breeze, while the 125 kg ball weight (appox by Jayco) didn't affect my LandCruiser suspension adversely. The tare weight of 1130 kg (appox by Jayco) is much higher than (most of) the aforementioned tent trailers, but a mile lighter than any full sized van. ‘Tardis’ is the very first word that entered my mind when I first stepped into an open Swan. For a camper trailer, the insides are enormous to the point of unbelievably spacious. The next thoughts were ones of ‘comfort and opulence’ – for a camper trailer. The standard inclusions of four-burner cook top, griller, microwave oven, many cupboards and storage drawers made living in this Jayco camper the most comfortable camping foray I have ever undertaken. Dual 100amp deep cycle batteries ensure a long 12-volt camp-out, while the two 9kg LPG bottles ensure a long fridge and cooker span. Water storage is 90L as standard, although there is provision to carry a 20L jerry can on the draw bar. To have a comfortable lounge to flop into at the end of a hard days fishing or hiking, was a real treat, as was the ability to turn on the hot and cold water, overhead lights, or even the outside hot and cold shower – my rough and tumble camping days may be numbered after playing with this Jayco, especially when heading out bush with my young family – and that’s exactly who these campers are aimed at! The large windows on all sides of this camper proved an absolute boon in the heat, allowing not just brilliant views of the great outdoors, but maximum flow-through ventilation. We even coped a few days of rain while off the coast and I’ll give the camper two thumbs up for water proofing – it didn’t leek a drop, other than a little wicking onto our pillows that were touching a seam on the beds. While I didn’t have the front and rear bed awnings erected which would have prevented this water ingress, perhaps this could be a slight design upgrade to either raise or lower the height of the seam so it was out of reach. Taking only 8 minutes to set the camper up by myself was surprisingly quick and easy. The fiddliest part was installing the top half of the door, but was still easy. If I erected the awnings over the front and rear beds, that did add an extra few minutes, but is well worth it for the sun and rain protection they provide. For my needs and wants – a young(er) adventurous family getting of the beaten track with a 4WD – I rate this style of camper very highly and I’d own one in a flash. After leaving Sydney, we discovered the 12V water pump was not working correctly. A stop at the Jayco dealer in Coffs Harbour, Watsons Caravans, saw the plumbing repaired and us on our way in no time. Full marks to Adam Watson and the team at Coffs. Jayco Sydney can be contacted on (02) 9623 1971, or drop into 63-67 Glossop Street, St Marys in western Sydney. Thanks go to a not-to-nervous David Carrack, the boss at Jayco’s Sydney HQ, who gave the nod to a journo taking one of his campers away for one month. EDIT: Since the magazine publication of this article, unfortunately David has passed away. My thoughts go to his family and many friends. David was a great bloke to deal with and we often shared many a laugh in his office. See ya mate, I'm sure you're comfy up there.